This conversation between His Divine Grace A.C. Bhaktivedanta Swami Prabhupada and physicist Gregory Benford took place in October, 1973, at the Los Angeles Krishna center. Dr. Benford: You are probably familiar with what Western theology calls “the problem of evil”: Why does evil exist? Srila Prabhupada: Evil is the absence of good, just as darkness is the absence of sunlight. If you keep yourself always in the light, where is the question of darkness? God is all-good. So if you keep yourself always in God consciousness, then there is no evil. Dr. Benford: But why was the world created with evil men? Srila Prabhupada: Why was the police department created? Because there is a necessity. Similarly, some living entities want to enjoy this material world; therefore God creates it. He is just like a father who gives a separate room to his mischievous children to play in. Otherwise, the naughty boys would always disturb him. Dr. Benford: This world, then, is something like a prison? Srila Prabhupada: Yes, it is’ a prison. Therefore, there is suffering here. In the prison house you cannot expect comfort, because unless there is suffering, there is no lesson for the prisoners. That is stated in the Bhagavad-gita duhkhalayam ashashvatam: Duhkhalayam means “the place for suffering.” And ashashvatam means “temporary.” You cannot make a compromise and say, “All right, I am suffering, but I don’t care about that—I shall remain here.” You cannot remain here; you will be kicked out. Now you are thinking that you are an American, you are a great scientist, you are happy, you are getting a good salary…. That’s all right, but you cannot stay in this post. The day will come when you will be kicked out. And you do not know whether you are going to be an American or a scientist or a cat or dog or demigod. You do not know. Dr. Benford: I think that I will probably be nothing. Dr. Benford: But after I’m an old man I might be nothing. Srila Prabhupada: No, no. Tatha dehantara-praptih: after death you will pass into another body. So. you cannot say, “I am going to be nothing.” Of course, you may say anything, , but the laws are different. You may know the law, or you may not know the law.’ It doesn’t matter—the law will act. For example, if you think, “I will touch the fire—it will not burn me,” that is not a fact. It will burn. Similarly, you may think there is nothing after death, but it is not a fact. Dr. Benford: Why does a person like me—someone who’s trying to understand the world rationally—seem to find no way in which to do it? Srila Prabhupada: You are trying to know things rationally, but you are not going to the proper teacher. Dr. Benford: But I feel that by studying the world I can acquire knowledge, and there is a way to check that knowledge. You formulate hypotheses, you perform experiments, you verify your ideas, and then you see if you can use these ideas in the practical world. Srila Prabhupada: That is one more kind of ignorance—because you do not know that you are imperfect. Dr. Benford: Oh, I know that I’m not perfect. Srila Prabhupada: Then what is the use of your trying to study the world this way and that way? If you are imperfect, the result will be imperfect. Srila Prabhupada: So why waste your time? Dr. Benford: But there doesn’t seem to be any other way of finding knowledge. 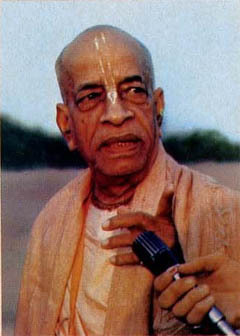 Srila Prabhupada: Even for material knowledge, you have to go to the university and consult a professor. Similarly, when you want to learn spiritual knowledge—perfect knowledge—you have to approach a perfect teacher. Then you will get perfect knowledge. Dr. Benford: But how does one know when the teacher is perfect? Srila Prabhupada: It is not difficult. A perfect teacher is one who has learned from another perfect teacher. Dr. Benford: But that merely removes the problem a step. Srila Prabhupada: No, because there is one perfect teacher—Krishna—who is accepted by all classes of teachers. In India we still find the Vedic culture, which is taught by Vedic scholars. And all these Vedic teachers accept Krishna as the supreme teacher. They take lessons from Krishna and teach that. Dr. Benford: So anyone I meet who accepts Krishna as the perfect teacher—he is a perfect teacher? Srila Prabhupada: Yes. Anyone who is teaching the teachings, of Krishna—he is a perfect teacher. Dr. Benford: Then all the devotees here are perfect teachers? Srila Prabhupada: Yes, because they are teaching only Krishna’s teachings, that’s all. They may not be perfect. But whatever they are speaking is perfect, because it is taught by Krishna. Dr. Benford: Then you are not perfect? Srila Prabhupada: No, I am not perfect. None of us claim that we are perfect—we have so many defects. But because we don’t speak anything beyond Krishna’s teachings, our teaching is perfect. We are just like a postman who brings you a money order for one thousand dollars. He is not a rich man, but if he delivers to you the envelope as it is, you are benefited. He is not a rich man, but his perfect dealing—his honest dealing—is perfect. Similarly, we are not perfect; we are full of imperfections. But we don’t go beyond the teachings of Krishna—that is our process—and therefore our teachings are perfect.